My new firing method seems to be improving as I continue to test it. 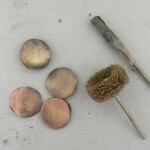 Here are a few results from further testing, including thick pieces of copper that fired successfully. Just to clarify, all testing has been done with Quick-fire clay. The most important thing is: do not cover the carbon with the blanket! If you do, you’ll have to take the pieces out of the kiln while still hot and cool them in water to prevent oxidation. If you prefer to wait until the kiln is cool (as in overnight firing), don’t use the blanket or any other lid. Here is an updated description of the process. This description replaces my previous posting. Eventually I will incorporate it in the instructon manuals. 1. Fold a fiber blanket into a “box” (detailed instructions in a future posting). The walls of the box should be away from the walls of the kiln chamber. If the walls refuse to stand upright, support them on the sides with posts. 2. 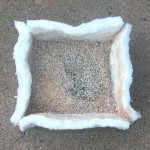 Line the inside of the blanket “box” with a ½” layer of carbon. 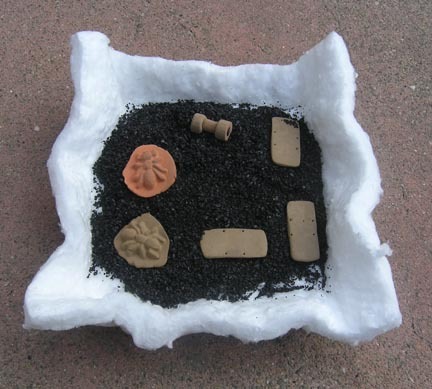 Arrange your pieces on the carbon bed. As usual, avoid the center. Cover the pieces with another ½” layer of carbon. You can start the firing in either a cold or a hot kiln. You can take the pieces out of the kiln while still hot or wait until they cool down. Overnight firing works fine. If you take them out hot, use heat-protective gloves. 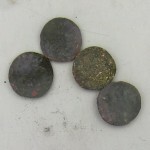 After firing, most of the carbon will have turned into ash. 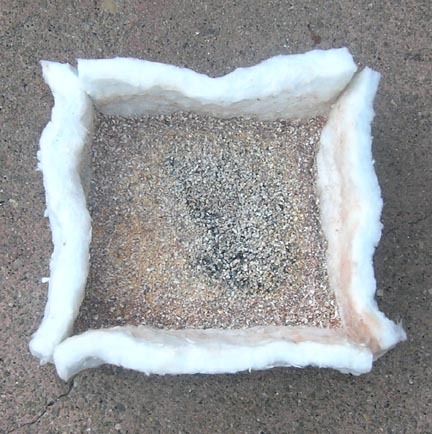 Pick up the fiber “box” from both ends and lift it out of the kiln. 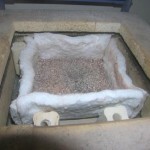 All the ash stays contained in the box; not a grain of it is left in the kiln. To retrieve your pieces you can pour the ash through a sieve while still hot, into a metal container. Discard the ash. The pieces shown include bronze, 16 cards (2 craft sticks) thick; bronze, 6 cards thick; copper, 4 cards thick; and mixed, 6 cards thick. All are unbreakable. No carbon is used. Ramp at full speed to 1690°F/920°C (top loader) or 1770°F/965°C (front loader). Hold for 30 minutes. Remove from the kiln while hot, and cool in water. 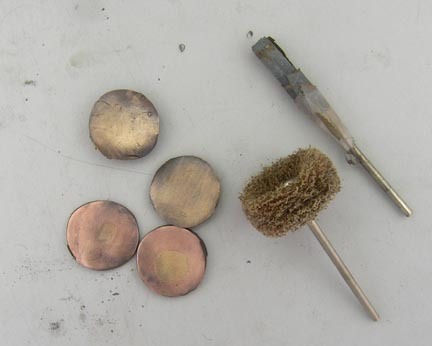 Instead of a ½” layer of carbon, cover the pieces with a 1” layer. Important note: think of the pieces in the carbon in terms of food in the microwave. There is a fixed amount of energy divided among the pieces. The more pieces there are, or the bigger they are, the less energy each of them gets. 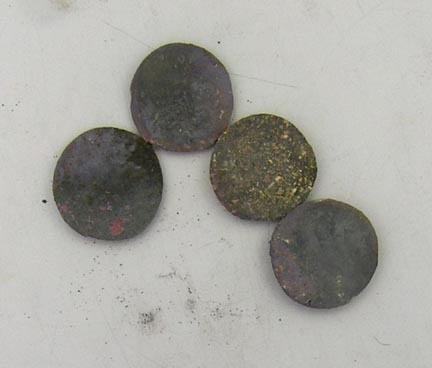 When firing bronze, increasing the amount of energy by increasing the temperature is not an option since the bronze will blister. 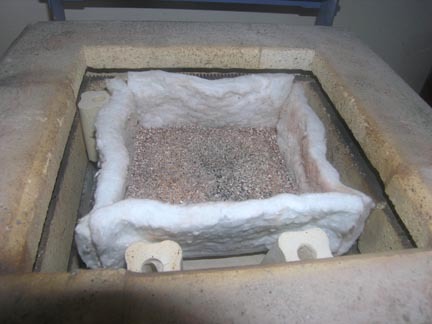 When firing just copper, thin or thick, small or large, raising the temperature is an option, and it’s still being tested. Again, the “Hot Firing” schedule can be used. Cover the pieces with more carbon, as much as the box allows. Again, do not use a lid. In this case, not all the carbon will have turned into ash and you may want to reuse what is left after vaccuuming. This entry was posted on Wednesday, February 3rd, 2010 at 3:57 pm. You can follow any responses to this entry through the RSS 2.0 feed. You can leave a response, or trackback from your own site.